Sleep is the state of natural rest observed in humans and throughout the animal kingdom, in all mammals and birds, and in many reptiles, amphibians, and fish. Sleep is necessary for survival. And how you sleep will affect your morning. If you’re waking up sore and achy and your mattress is new, you may need to reevaluate how you’re sleeping. Below are the 3 most common sleep positions adopted by humans all over the world and their health effects. Lying flat on your back forces your spine into an unnatural position, which strains the muscles, joints, and nerves. The spine isn’t meant to be straight. It has three natural curves. One in the lower back, one in the middle of the back, and one near the neck. Snoring also happens mostly because of this position. If you must sleep on your back, place a pillow under your knees to help maintain the normal curve of your lower back and to reduce the pressure on the sciatic nerve in your lower back. A small rolled towel under the small of the back would do good as additional support. Always support your neck with a pillow. Snoring doesn’t happen when you sleep on your sides. The sleeping position to be avoided. Sleeping on the abdomen exaggerates the arch at the base of your spine and cause strain. It is hard on the back and uncomfortable for the neck. 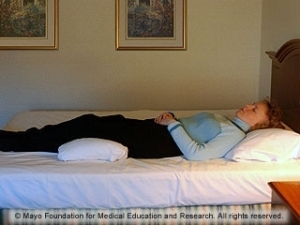 This sleeping position is only recommended to those with degenerative diseases or herniated disks in the central portion of the spine. Other than that, don’t sleep on the stomach. Break the habit by taping a beer bottle to the front of your pajamas. The No.1 recommended position. Make a habit to sleep sideways. It takes the most stress off the back. Take the comfort further by placing a pillow between your knees to naturally support your hips and lower back. Use a bolster if you prefer. This sleeping position is beneficial for those with hip pains, osteoarthritis in the spine or spinal stenosis (narrowing in the spine). What about the studies that have been done that show that sleeping on ones stomach/abdomen helps lower blood pressure and aids in digestion? You are right Casey. Sleeping on your stomach/abdomen does lower your blood pressure but it is bad for your spine. It’s a much better idea to use exercise and healthy eating habits to lower your blood pressure instead of relying on a controversial sleeping position. Previous Previous post: Types Of Soup From Around The World. Here Are 55 Tasty Ones.